It was fully deserved. England are too good for any team in this group. We saw that on Friday too. They are full of confidence and far superior. I expect them to win this group without a defeat or a draw. England midfielder Ross Barkley, who scored twice, tells ITV: "It was a great night for myself. Montenegro was always going to be a hard test but we showed character to come back and put in a positive performance. "From the first minute of the training sessions Callum Hudson-Odoi has been top drawer. He fully deserved the start." England winger Callum Hudson-Odoi tells ITV: "Hopefully I did well, it is not about me, it is a team performance. Great mentality from the start, going down was disappointing but we got back into it. I reacted slow to the ball and they scored from it. We have to react positively and keep going. "I just have to keep working hard in training and hopefully get an opportunity to start (in the Premier League). Another fantastic night of international football, provided to us by England. I'll leave you with the best reaction from tonight's game. In this day and age the so-called weaker teams are actually getting better and they are getting harder to beat. So this is a great achievement. The attacking talent that Gareth Southgate has to pick from... his biggest problem is where to put them all! England have won five consecutive matches for the first time under Gareth Southgate. It’s the first time they have won five in a row since October 2015 under Roy Hodgson. Callum Hudson-Odoi (18y 138d) became the second youngest male player to start a competitive match for England after Wayne Rooney vs Turkey in April 2003 (17y 160d). Montenegro have won just one of their last six matches (W1 D1 L4), drawing 1-1 in their first qualification game against Bulgaria before losing tonight versus England. ITV's pundits have been discussing the abuse directed towards England players. Former England striker Ian Wright: "It will probably go to Uefa and they'll be fined a pittance and we'll get the same thing again here the next time or somewhere else in Europe. It's not going to stop them." Former England midfielder Joe Cole: "We need to shine a light on it. As a nation we need to take a lead on it. It's out of order and England players shouldn't have to deal with it." Raheem Sterling has taken a lot of stick from the crowd so why can't he celebrate like that? One week we want players to show passion and emotion and the next we are criticising their reaction when they are getting abused all game. England manager Gareth Southgate, asked about suggestions of racist abuse towards some of his players: "I definitely heard abuse of Danny Rose when he got booked at the end of the game. There's no doubt in my mind that happened and we'll report it to Uefa. It's not acceptable. 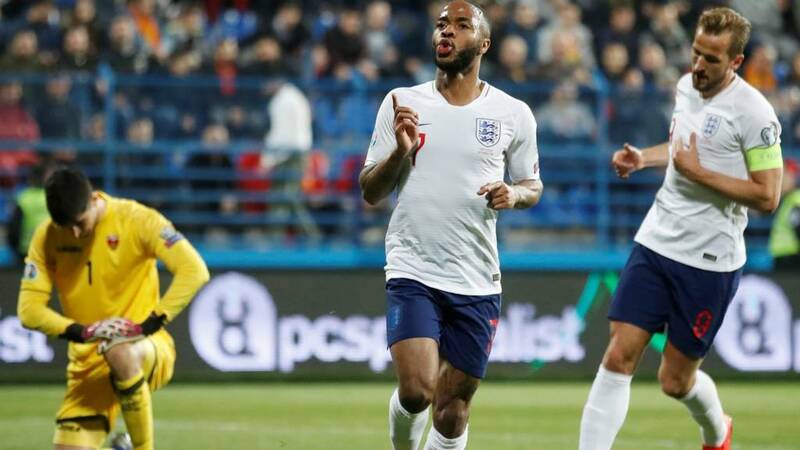 Asked whether Raheem Sterling also experienced abuse after the forward celebrated by putting his hands to his ears in front of the Montenegro fans: "I'm not sure about Raheem. I had a quick chat with Danny but I've not had a chance to speak to Raheem. It's 2019 and we're sat here talking about players receiving racist abuse during a game of football. Our football correspondent John Murray has been speaking to some photographers who have told him that the abuse the England players have received this evening has been disgusting. Jordan Henderson has got the ability to see a pass and he has been able to do that because he has that freedom behind him. He did it against the Czech Republic as well. I don't think there's really been a weakness from England in the two games. They are all full of confidence and it's all been very positive. World champions France thrashed Iceland to gain their second victory in two Euro 2020 qualifying matches. Samuel Umtiti put the hosts ahead with a glancing header from Kylian Mbappe's left-wing cross after 12 minutes. Oliver Giroud added a second when the ball was pushed into him following Benjamin Pavard's right-wing cross. Mbappe scored a third from Antoine Griezmann's pass, before the Atletico Madrid striker netted a fourth six minutes later to seal the victory. France have now scored eight goals in two qualifying games after they beat Moldova 4-1 in their opening qualifier on Friday. Didier Deschamps' side lead Group H on goal difference, ahead of Turkey, who also have six points from their two games. Who has impressed you so far? Who needs to do better? You can rate the players here. I definitely heard another racist chant towards Danny Rose after that challenge. Another five star showing from England. They come from behind to swat aside Montenegro with another stylish performance.